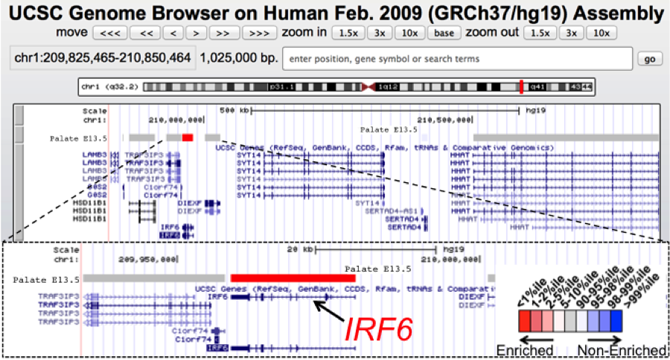 UCSC genome browser view of a 1 Mb genomic interval containing IRF6, a gene associated with orofacial clefts. IRF6 mutations lead to the autosomal dominant van der Woude syndrome (VWS) or the related popliteal pterygium syndrome. VWS includes cleft lip and palate as a prominent feature along with dental anomalies and lip fistulas. Positional cloning of VWS gene (IRF6) took considerable effort with sequencing of many candidate genes in the genomic interval. Using SysFACE tracks, we can readily visualize that IRF6 has the highest palate specific expression among all the genes in this mapped genomic interval and therefore is identified as the best candidate for further analysis. IRF6 has now been identified as a candidate gene in many genome-wide association studies for non-syndromic orofacial clefts.